Apple will release a slightly tweaked version of its existing iPad alongside a much-rumored 7-inch model after the sixth-generation iPhone launches in early September, says KGI Securities analyst Ming-Chi Kuo. In a note to investors shared with AppleInsider on Tuesday, Kuo said Apple is set to debut a next-generation iPhone in early September and will follow up with a smaller 7-inch iPad model shortly after. Kuo notes that iPhone unit shipments shouldn't see a massive bump during the launch quarter, however, as limited component availability, a short on-sale time and a backlog of consumers holding out for the new handset will result in only a slight sales increase. "iPhone 5 to debut in September. But due to in-cell touch panel and casing yield rate limits, ability to offset older models' shipments decrease will be moderate," Kuo writes as one of his bullet points for the upcoming second half of 2012. Trailing the new iPhone's launch will be a rumored smaller iPad model, also seeing a likely announcement in September following a manufacturing ramp-up in August. While initial sales of the as-yet-unannounced device will be somewhat modest, Kuo sees an impressively strong performance in the holiday quarter and estimates sales of over 13 million units. 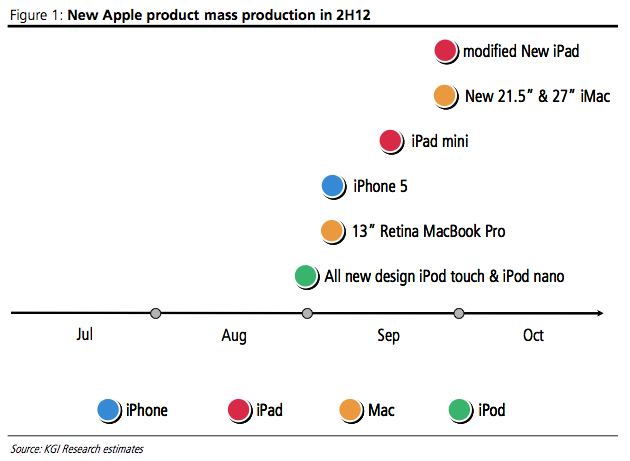 If correct, the sales numbers would put the so-called "iPad mini" out in front of its bigger brother. The iPad mini estimates are in line with recent reports that claim Apple's Chinese manufacturing partner Foxconn is already hiring extra staff in a build-up to mass production next month. Adding to earlier reports which claimed Apple may be tweaking the internals of the third-generation iPad, Kuo's sources say the changes won't be aesthetic and are meant to cut component costs and improve thermal performance. The modified third-generation iPad is expected to hit shelves in October. While third quarter sales may be soft for the Cupertino-based company, Kuo sees huge gains going into quarter four thanks in large part to the introduction of new iPad and iPhone models. He pegs Apple's handset sales to hit 55 million in the fourth quarter of 2012 and iPad product line sales closing in on 24 million during the same period. Also on the docket for this fall is a rumored redesign for Apple's iPod touch and iPod nano media players. At this point details are scarce, though Kuo claims the new devices will feature technology from both the sixth-generation iPhone like a larger screen as well as components from existing iOS products like the A5 processor found in the iPhone 4S.